Choose where you want to go to and how long you want to stay! A passion for backpacking and a dedicated hard working team helped to create this unique transport network in South Africa. Today, Baz Bus is a leading force in the backpacking Industry. We now have 180 hostels along our route and we carry over 10 000 independent travellers on our buses each year! Our well established transport network provides travellers with a safe and reliable way to travel the country. 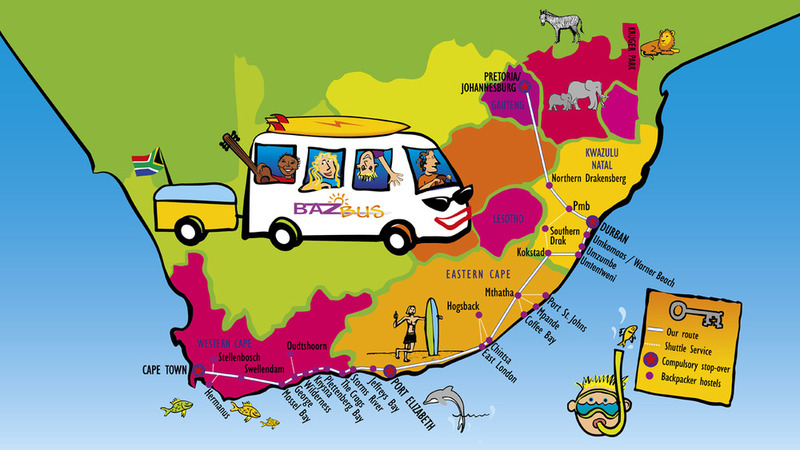 Baz Bus runs in each direction between Cape Town and Johannesburg/ Pretoria with stops along the coast. Simply buy one ticket to your final destination and can get on and off as many times as you want, wherever you want, with no time limit. Our map is easy to understand and I will highlight the important points to remember. This is the solid white line which outlines the route we travel. The dotted lines on the map refer to shuttle services. To reach out of the way places or remote areas such as the Wild Coast etc, shuttle services are operated by the hostels in these remote areas. There are extra charges for these. Please contact the hostel of your choice for further details and to book your shuttle in these areas. The shuttle service will meet Baz Bus at an agreed point and then do a handover of passengers so essentially it is still a hop on hop off service. These are the cities and backpacker hostels we stop at along our route. I need information about your weekly bus from Durban to Drakensberg. My wife and I will spend a holiday in Cavern resort and there should be a connection to The Amphiteatre. So I would like to know what day and time from Durban, vice versa from The Amphiteatre back to Durban. I hope you could answer my question.